Note: This entry has been restored from old archives. 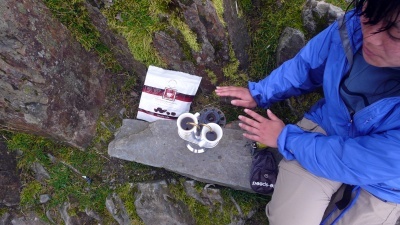 This could be an interesting theme: climb mountains and make espresso at their peaks. Our destination was the Hafod-y-llan National Trust campsite, luckily Mr Land Rover was going to the cityfolk campsite at the other end of the lake. By the time we got there it was dark, certainly dark enough that torches were required to put our little tent up. Alas, we’d only packed one instead of the two we should have had. After wandering the little camp ground for a bit we settled on a clear patch on a bit of a slope, we’re quite happy with slopes really. A nearby camper kindly lent us his head torch and we were all set up in 10 minutes. After some more fiddling we eventually got to bed at 23:00. It was a slightly rough night of sleep for two reasons. First, I’d worked out how the ends of the tent could be adjusted to improve airflow – I, perhaps, “improved” the airflow a bit too much. The idea being reduction of condensation. The two of us cause quite a lot of this over a night, it is almost as if it somehow rains on the inside of the tent. 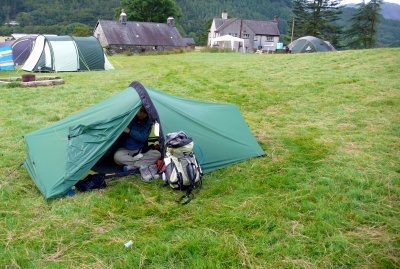 Our tent is a dual-skin though, so this causes only minor difficulty in the morning. I wipe down the inside of the door with one of our chamios-like micro towels. If we’re to pack up or tents that day, as we were every morning on our Lakes hike, we then combine our efforts, and towels, to towel down the entire inside (and then the outside if it has rained.) Though this seems involved, it really doesn’t take all that long. One of the prices you pay for putting two people in a very small tent perhaps. The second reason was that we’d unthinkingly let Yaël traipse off with one of our sleeping bags (for a friend she was travelling with.) On the day we were to leave we realise this, oops! So we had one sleeping bag between us, unzipped to be used like a blanket. It wasn’t too bad in the end, but not ideal. We got up nice and early in the morning, 6AM for me. And prepared to trek off. Putting the bits we wanted for the day into Kat’s pack, which I was to wear. And a few items of food into a micro pack we have for Kat. Kat’s pack doesn’t fit me too well, but it is fine when the weight is only about 6 or 7kg. To begin the day we wandered down the driveway of the campsite to Bethania, where the Watkin Path up Snowdon begins, and where there also happens to be a Café. The café opened at 08:00, 10 minutes after we got there, so we waited. The café is huge, an old chapel in fact. It was bought by a group of locals I’ve read, and converted to its current use as a place of refreshment. Alas, their espresso is terrible, but that is no surprise. 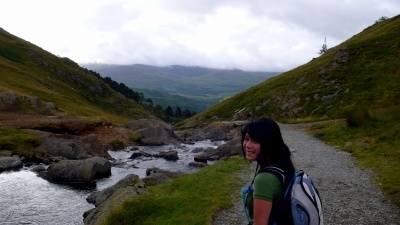 At 08:30 we were on the Watkin path, on our way to Snowdon’s summit. At first the Watkin path is a leisurely stroll through woods and fields. Passing some intriguing old stonework. Essentially some very straight and raised paths down steep slopes. You’d think they’re old train lines, except that they’re very steep and don’t seem to take logical routes as compared to other train lines in hilly regions. One cuts straight up a buttress of Yr Arran, following a gradient reminiscent of a rollercoaster ramp. Funny place for a rollercoaster though! Some research reveals that these are the paths of slate inclines, and that this one, in fact, was never completed. Passing this puzzling sight we’re on an impressively paved stone path up the valley of Afon Cwm Llan. This is a beautiful watercourse, given sunlight and a few degrees more warmth I doubt I could have resisted going for a dip in one of the many spa-sized pools of crystal clear blueish water (is it blueish due to the copper in these mountains I wonder?) The path passes some interesting stone buildings at a narrow point in the valley, some sort of fortification perhaps? Fortifying what though? The old ‘net is littered with references, the closest fitting of which is that it could have been the residence of the master of the slate mine. There are a few more buildings along the path, as it makes its way up the valley. Finally there is a long one with a track heading out from it which loops around and forms a well defined road-like track on the other side of the valley. We wonder if this links up to the crazy-steep line on the other side of that ridge. An engine house of some sort perhaps? (I’m going to have to look all of this up when I get home. No Internet in the middle of a field in Wales!) Now, much later, I can look this up and it seems most likely that the long building is the barracks which housed the slate mine workers during the weekdays. 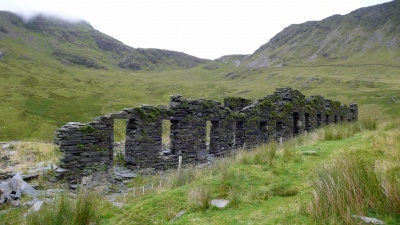 The slate mine itself is said to have only operated for about 40 years, the slate there being of low quality. Modern evidence of this is said to be visible in how overgrown with grass many of the old tailing heaps are. This indicates that there was much dirt dug up with the slate, which isn’t at all good I take it. I presume they kept going in the hope the dirt would go away … but eventually hope, or money, ran out. After passing the “engine house” the path becomes steeper, though still well paved. The stretch up the side of the valley is the most picturesque leg of our hike. Views above, views below, and since we aren’t in the clouds yet, views for miles around. We can even see the coast from up here. 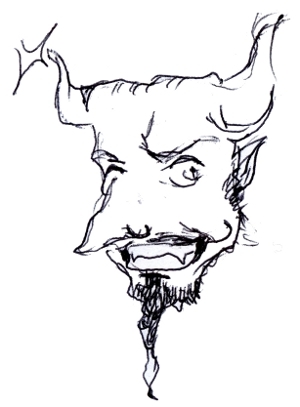 Plus, there are goats, goats with huge horns, goats cannot be beaten. 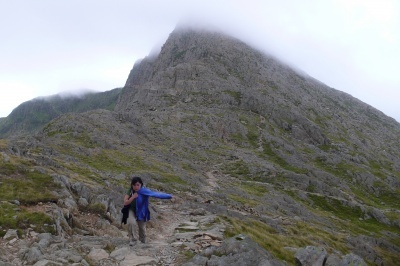 Rough stone steps take us up to the top of the ridgeline, Snowdon’s buttress out to Y Lliwedd. This is Bwlch Ciliau, where the path flattens out and follows the ridgeline over Bwlch Saethau. (Note that, this being Wales, I can only guess that the names near peaks and valleys are actually names I can apply to said peaks and valleys!) The walk along this ridge provides for some excellent photos if you follow one of the minor tracks off to the right. 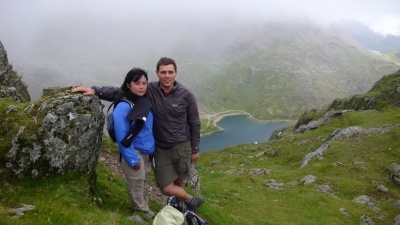 You find yourself at the top of a huge cliff looking down on Glaslyn, it is an excellent view for a photo. The ridge takes you from about 750m to the 825m mark, where the going gets tougher. 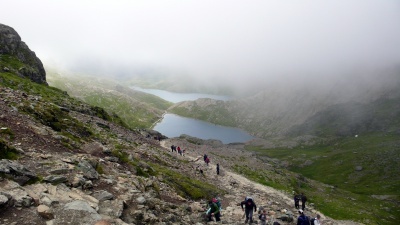 The route turning into quite a scramble as you make it up the final 200m to the peak. By the 800m mark we were in cloud, so just like our Scafell climb the summit looks like it won’t be giving us much of a view. A little sad, I cross my fingers and hope it’ll clear before we descend. The last 50m of ascent is something of a stroll. It is all a little strange, we begin to hear the chuff-chuff of a steam engine, and soon a large building looms out of the fog. Then we hit the people… it is like a shopping mall. We skirt the building, past people clustered around the building entrance sucking on fags, looking a lot like they would rather be elsewhere. Fathers and husbands dragged along for the ride perhaps. Then we’re there, a short stone platform with two sets of stairs and the trig-point at the centre. It is crowded with people. More than one use for coffee! We wander around to the more sheltered north eastern side of the platform, using it as a wind break. Not bothering to venture to the top in a hurry, we can wait for a break in the crowd. I get out my little meth-burning stove and fill-er-up. We almost had a major disaster on this trip, I forgot to bring fire. I use a flint to light the stoves, which is a case of lighting either meths or wax-impregnated card (Hammarö paper.) It works surprisingly well. Unfortunately it didn’t come with us! We were somewhat lucky that the café at the bottom of the Watkin Path sold lighters and matches, so I bought a lighter. All hunky dory now right? No. I don’t have a lot of experience with lighters, and didn’t realise how crap your typical lighter is. This one doesn’t like to light if there is anything so much as a breeze, it lit inside the café just fine, which is the only place we tested it. On top of Snowdon all it would do is spit a few sparks, not good enough to light meths. So I had the smart idea of applying an old trick from when I was a kid, adjusting the +/- wheel so that the + was even more +! As soon as I took the silver shield off the lighter the wheel fell out and it was only by luck that the little bit of flint was jammed and didn’t fly off. Now I had to get the flint back down the little hole, compressing the spring. This is hard to do at the best of times, but with numb fingers close to impossible! With the aide of the tweesers from Kat’s pocket knife I put it back together… after 15 minutes and almost losing the flint twice! I extra-plussed the + and we were soon back in action! Café Snowdon espresso was enjoyed, we even made second shots. At least this amused some of the multitude of people up there. Including a couple of guys who were enjoying some beers they’d brought up with them (on foot, not by the train, so respectable in a way especially as one of them had brought both pints up as a surprise for the other.) They took some photos for us and we took some for them. We took some photos on the trig-point platform as well, though I now realise I never even bothered to look at the plaque on the trig point. Next, Kathlene keen on some hot food, we headed for the actual café that is up there. We squeezed in, it is a huge space so having to squeeze indicates how packed the place was, then immediately I turned around and squeezed out. Insane! Horrible! 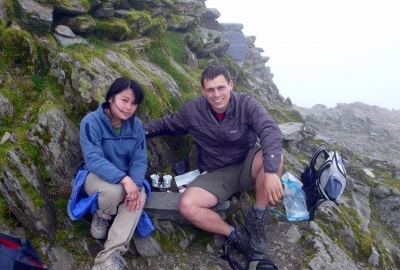 I promised Kat we’d find some hot food after our descent and we began our downward route. Alas, the cloud never cleared. I’d worked out a full circular walk in advance. After the hard trek up the south side of Snowdon we were to take a more leisurely route downhill to the east, before following the valley south west and back to the camp. 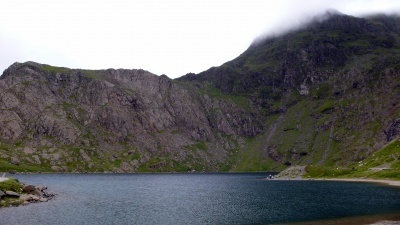 This begins by heading north from the summit and then east down the Pyg track, before descending onto the Miners’ track which runs alongside Glaslyn and Llyn Llydaw. Talk about busy! This route was a bumper-to-bumper highway of human traffic. Very frustrating at times as most of them make their way along the track very slowly and there are several stretches where overtaking isn’t possible, and waiting for oncoming walkers is necessary. Aside from the difficulties posed by the popularity of this route it provided some wonderful views. Most of the time the view down the valley over the lakes is present, and all the time the steep walls to the north and south loom overhead. From the shores of Glaslyn we could see the spot where we took the photo of ourselves on Bwlch Saethau with Glaslyn far below. On the western side of Glaslyn towering cliffs running straight up to the summit of Snowdon, lost in cloud, dominate the scene. The route along Glaslyn and Lyn Llydaw is flat and wide, allowing you to focus more on the scenery than where you’re putting your feet. As with much of this countryside there are ruins littered around the landscape which intrigue the mind. In this area most of these high ruins are mining related, generally either slate or copper. By Glaslyn and, further down the track, Llyn Teryn are the remains of miners’ barracks. 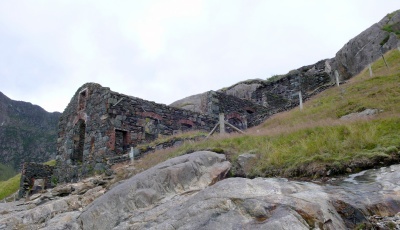 While, most impressive, is some sort of mine working building on the shore of Lyn Llydaw. The rest of the walk to Penn-y-Pass continues to be straightforward and before long you find your self at an ugly car park. There isn’t much here, I had hoped for a nice little pub, but there is just a caf which can do you a solid hot meal. From Penn-y-pass you could catch a bus back around to Bethania, but we did the valley walk. This home stretch took us down Afon Trawsnant, then Afon Glaslyn. From not long after Pann-y-Pass to well past the power station this path is very wet. Good high boots with reasonable waterproofness are highly recommended! The path takes you behind the veritable metropolis of the fancy campsite to the north-east of Llyn Gwynant, then on behind the lake itself. The walk behind the lake takes a fairly high route and provides for some excellent views down over the lake. This was also the best area for us to gather sticks for our excellent little Bush Cooker, my pockets were soon bulging with nice dry wood. A few fields later we’re back at the Hafod-y-llan campsite. We’d set out at about 0800 and got back at 17:00, with at least an hour’s worth of stop time along the way. 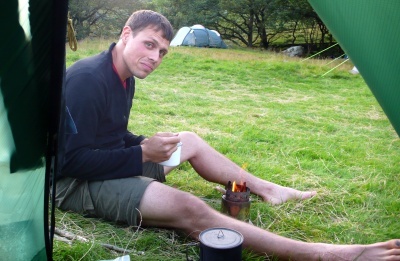 Our 17:00 return gave us plenty of time to chill out, make some coffee and dinner, and relax. Quite an excellent day all up. We’re calling this walk the Devil’s Circuit… I do hope you can see why. Our path took us up quite a steep route, which was clear and well paved all the way to Bwlch Saethau. The final ascent towards the summit became quite loose and confused at times, with hands being required at some points. I can see why this route is considered quite dangerous in winter. At one point you’re traversing a scree slope that ends with a cliff, imagine it covered in ice and snow! One way ticket to splat. 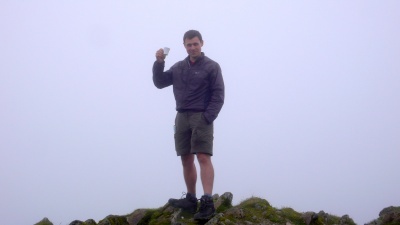 The summit of Snowdon is very civilised, too civilised really. Scafell Peak wins any summity goodness competition hands down. We will go back, but in the off season, when the train isn’t running… hm, perhaps I should get some ice axes and crampons for that one 😉 Meanwhile, I’ve been playing with generating SVGs of these walks, the most interesting of which is elevation over distance covered.